There are many reasons to choose an SUV as your new vehicle. Ruggedness, cargo room, and performance are all things that would make it a satisfactory vehicle to cruise around [location] in. Among the crop of SUVs available, the 2019 Jeep Grand Cherokee seeks to set itself apart with noteworthy performance features. The Trackhawk model of the Grand Cherokee is a first-class performer. It's powered by a 6.2L supercharged V8 engine that pushes the vehicle from 0-60 in 3.5 seconds. Drivers can appreciate exactly how well the Trackhawk performs with feats such as an 11.6-second quarter mile. 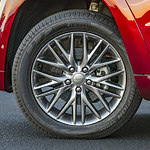 Traction is another feature that the engineers who crafted the Grand Cherokee focused on. The Bilstein Adaptive Suspension system can tailor the damper for sport or track performance as desired. The suspension works in conjunction with an Electronic Rear Limited Slip Differential that has four point axel mounting to keep the Jeep Grand Cherokee gripping the road at all times.